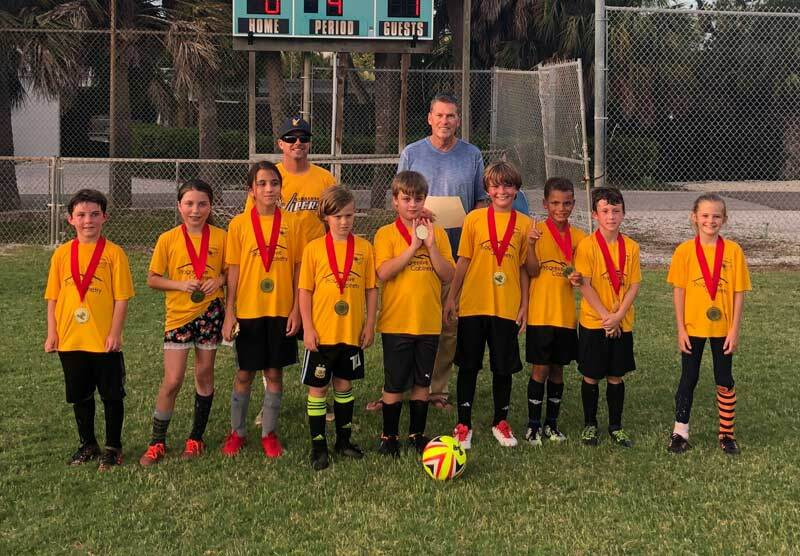 Progressive Cabinetry shut out Bins Be Clean 1-0 in the May 23 championship game of the youth soccer league at the Center of Anna Maria Island. Gregory Jordan scored the game-winning goal when he took a pass from Kierran Cloutier and hit a well-placed, left-footed shot to the lower left corner of the goal. From there, the Progressive defense, led by Cloutier in front of goalie Lily Kawahata, made the lone goal stand up. The third-place game saw Planet Stone roll to a 4-1 victory over Signarama behind a hat trick from Aiden Templeton and a goal from Krosby Lamison. Evan Talucci made a save between the pipes to help preserve the victory. Riley Lawson notched the lone goal for Signarama, which also received two saves in the loss from goalie Kendall Rice. Individual awards also were announced, starting with JM Feeney winning the defensive MVP award and Victor Albrecht goalie of the year. Liam Coleman captured the most improved player award and Lily Kawahata was named female MVP. Last, but not least, Jackson Pakbaz was named overall MVP of the league. The regular season for the adult soccer league at the center ended May 24, with Legler & Flynn Law still chasing perfection. 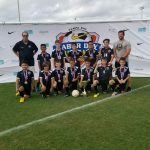 At 8-0, they’ve wrapped up the top seed and the easier path to the championship with a first-round playoff game against last-place Acqua Aveda. Lancaster Design finished in second place with a 6-2 record and will take on 1-6-1 Mar/Kis Insurance in its first-round match. Sato Real Estate held down third place with a 5-3 record and will take on sixth-place Moss Builders, which finished at 2-5-1. Fourth place went to Slim’s Place with a 4-2-2 record, matching them up against Ross Built which finished in fifth with a 3-5 record. Playoff action will start at 6 p.m. Thursday, May 31, with the second-round action set for Thursday, June 7. The championship and third-place games will be played June 14. The final week of regular-season action kicked off with Sato Real Estate rolling past Acqua Aveda 8-2 behind a hat trick from Francisco Oliviera and two goals each from Josh Sato and Damir Glavan. Eliza Faillace completed the scoring with a goal and an assist, while Jordan Demers made five saves in goal to help preserve the victory. Eric Pullen and Matt Plummer each notched a goal, while Miguel Ajoy, Scott Eason and Max Gazzo combined on nine saves in goal. First-place Legler & Flynn Law outscored Moss Builders 5-1 in the second game of the evening. Jermias Gramajo led the way with two goals, and Diego Felipe, Yorvi Moreira and Amy Ivin each notched a goal. Shay Coleman added an assist, while Felipe and Mark Rudacille combined on six saves in goal. Chris Scott tallied the lone goal for Moss Builders, which received six saves in the loss from Josh Bernet. Lancaster demolished Ross 6-1 behind three goals from Greg DeMeuse and a goal and an assist from Ricky Anderson. Trey Horne made six saves in goal, while also chipping in with a goal. Robert Armstrong completed the scoring with a goal while Danny Anderson added an assist in the victory. Ryan Hogan scored the lone goal in the loss for Ross, which also received seven saves from Robb Marshall. Slim’s Place eased past Mar/Kis Insurance 6-4 in the final game of the evening behind three goals from PJ Smargisso and a goal each from Nate Welch, Darrin Wash and Ray Gardner. Will Case helped preserve the win with five saves in goal. Manoj Kumar Poudel scored a hat trick to lead Mar/Kis, which also received a goal from Mike Brusso and five saves from Mario Prino in the loss. Sports enthusiasts are on notice for open registration for the adult flag football league at the center. The last day to register is Saturday, June 9. Cost for the league is $10 for center members and $126 for nonmembers. There is a $10 late fee for anyone who signs up to play after June 9. Player evaluations and a draft will be held at 7 p.m. Tuesday, June 12. The season kicks off June 21 with the schedule of games played Thursdays starting at 6 p.m.
Sponsors also are being sought. Call the center for more information at 941-778-1908 or visit at 407 Magnolia Ave., Anna Maria. Rain continued to plague the Key Royale Club, putting a damper on golf action at the club. The men were able to play their morning modified Stableford-system match May 21. Chuck Patrick carded a plus-7 to win the day’s proceedings by a point over second-place finisher Herb Clauhs. Heavy rains closed the course May 22 and May 23, but the men got in a nine-hole scramble May 24. 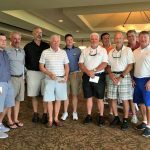 The team of Dean Boring, Chuck Patrick, Dan Richardson and Tom Solosky combined on a 7-under-par 25 to earn clubhouse bragging rights for the day. There was an outright champion during May 23 horseshoe action at the Anna Maria City Hall horseshoe pits. The team of Hank Huyghe and Sam Samuels posted the only 3-0 record in pool play to win the day’s championship. The rain kept most horseshoe players away May 26 — only two pitchers showed up. As the rain stopped, they played a best-of-three shootout. After splitting the first two games, Jay Disbrow rolled to a 21-9 victory in the deciding game to earn bragging rights for the day.